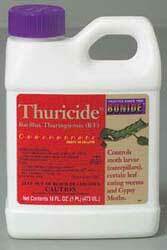 Bonide Thuricide® is a Bacillus Thuringiensis liquid concentrate' When a caterpillar type pest eats a leaf with this bacterium on it will stop feeding almost immediately and then die within 2-3 days of ingestion. When it is properly mixed with water in a spraying device, it controls caterpillars, gypsy moth larvae, loopers, cabbage worms, hornworms, leaf rollers, tent caterpillars, and other caterpillar type pests. It won’t harm beneficial insects. See the file “Using BT” for detailed information about how to use this product most effectively.